It seems like every other week I come across another news story touting the benefits of fish oil. From healthier hearts to improved brain function, fish oil has never been so in vogue. But the truth is that fish oil's role in good health is nothing new. Nordic populations in Sweden, Denmark, Norway, and Finland often credit their hardiness to a diet high in fish and fish oil. So it didn't surprise me to learn that the first studies of fish oil came out of Denmark. The extraordinary health benefits of fish oil were first discovered back in the early 1970s when doctors in Denmark studied Eskimos living in Greenland. They noticed that the Eskimos had fewer heart attacks and a much lower incidence of arthritis than the Danes, despite the fact that the Eskimos ate a high-fat diet. Studies from around the globe have since revealed that the health benefits of fish oil come from two omega-3 fatty acids EPA (eicosapentaenoic acid) and DHA (docosahexaenoic acid). Not surprisingly, these two healthy omega-3s are found in the fatty tissue of the fish consumed in great quantities by the Eskimos who took part in that early study. But despite the growing mountain of evidence that the omega-3 fatty acids in fish boast a bevy of health benefits, most Americans still don't in-clude enough fish in their daily diets. One reason is their growing concern about contaminants, especially mercury and polychlorinated biphenyls (PCBs). 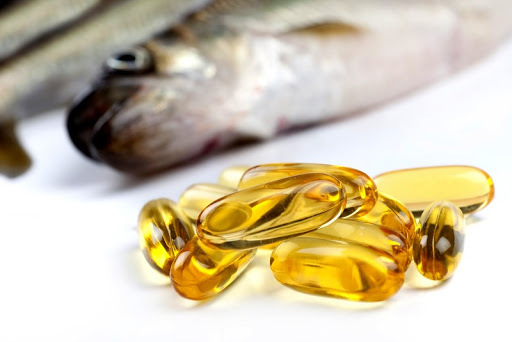 Fueled by reports that a single portion of certain types of fish can deliver more than the safe level of toxic chemicals set by the World Health Organization, many Americans are opting for fish oil supplements instead. Indeed, Americans are buying fish oil supplements at a rate that makes them the fourth most popular dietary supplement in the United States. To really understand what makes these omega-3s so special, it's impor-tant to look at the larger picture. There are two main types of essential fatty acids (EFAs) omega-3 and omega-6. Why are they considered es-sential? Because even though they are required for good health, the body can't synthesize these compounds from carbohydrates as it does other fatty acids we must get them directly from foods we eat. But that's where the similarities between these two types of fatty acids end. Omega-3 fatty acids are primarily found in fish with a high oil content such as anchovies, kippers, mackerel, herring, salmon, sardines, trout, and tuna. These EFAs have potent properties to quell inflammation, sup-port a healthy heart rate, and discourage blood clots and clogged arteries. Omega-6 fatty acids, however, come from the oils in seeds and grains such as sunflower, safflower, wheat, corn, and soy. Omega-6s are important for stimulating skin health and hair growth, maintaining bone health, regulating metabolism, and maintaining reproductive capability. Both of these EFAs are important to good health but only if they are consumed in the right ratio. Thousands of years ago, people ate equal amounts of these two types of fatty acids. But today, the standard American diet focuses on too much omega-6 fatty acids and not enough omega-3s an imbalance that may contribute to chronic health problems. According to Artemis Simopou-los, MD, president of the Center for Genetics, Nutrition, and Health in Washington, D.C., most Americans' diet typically contains 20 to 30 times more omega-6s than omega-3 fatty acids. This imbalance can have seri-ous consequences. "Humans evolved consuming a diet roughly equal in terms of omega-6 and omega-3 essential fatty acids," Simopoulos explains. "The traditional diets all resemble each other in that they are all balanced in EFAs and high in antioxidants. At present, the Western diet's ratio is so different from the natural diet on which our species evolved that it is at odds with our genetic makeup, increasing our risk of heart disease, cancer, diabetes, obesity, and immune disorders." I've known for years that balancing EFAs is critical to good health. Most nutritionists I've spoken to say that instead of a diet containing large amounts of vegetable oils, a well-balanced diet should consist of roughly one omega-3 fatty acid to four omega-6 fatty acids. This is easily accomplished by eating fish once or twice a week and taking a daily fish oil supplement. What happens to omega-3s and omega-6s after they have been consumed? Once in the body, EFAs break down to form eicosanoids hormone-like substances that regulate important bodily functions, including the nervous system, immune response, blood pressure, heart rate, blood-vessel con-striction, and clotting. Omega-3 fatty acids produce eicosanoids that de-stimulate coagulation and reduce the immune response. This means less clotting and inflammation, which is good for the heart as well as for au-toimmune and inflammatory diseases like arthritis. Omega-6 creates eico-sanoids that increase blood viscosity, regulate blood pressure, and sensitize nerve endings. What's more, omega-6 fatty acids promote inflammation as they convert arachidonic acid into prostaglandins and leukotrienes. While this can be a good thing if you are ill or injured, consuming large amounts of omega-6 fatty acids and small amounts of omega-3s can trigger chronic low-level inflammation that can lead to serious medical problems. While fish oil benefits everyone, expectant mothers have a special need for this omega-3 nutrient. Researchers have discovered that a pregnant woman who supplements with omega-3 fatty acids has less risk of premature deliv-ery. Their babies are also more likely to be born at a healthier weight. Essential fatty acids are so important to infants that in 2002, the U.S. Food and Drug Administration (FDA) approved supplementing baby for-mulas with both omega-3 and omega-6 fatty acids. Both are critical to fetal and infant neural development. DHA and arachidonic acid are incor-porated into brain cells and the cell membranes in the eyes particularly in the third trimester and during the first few months of life. Studies show that babies fed a formula with a high DHA content have significantly better eyesight by the time they are 4 months old compared to infants fed a formula that doesn't contain this important fatty acid. They may also have an edge in terms of early development. Researchers at the University of Kansas found that infants born to mothers with higher blood levels of DHA at delivery were more advanced and had better atten-tion spans well into their second year of life. During the first six months of life, these infants were two months ahead of those babies whose mothers had lower DHA levels. But if you are pregnant, getting DHA from food can be a problem. The FDA recommends eating up to 12 ounces of shrimp, canned tuna, salm-on, pollock, or catfish weekly. But concerns over mercury levels in fish have many pregnant women turning to fish oil supplements as a safer way to give their babies the nutrition they need.